Our speaker systems are suitable for any presentation, including weddings, corporate conferences, exhibitions and parties. They come with a wired microphone and iPod/PC cable which will enable you to speak as well as play music from a suitable electronic device. We only use first grade components to ensure best quality sound. 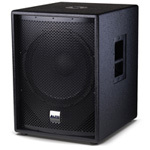 We have listed 3 popular configurations which cover most sound reinforcement needs. The 1 speaker PA system is suitable for small functions such as restaurants and small venues with up to 80 people. The 2 speaker PA is for events with 80-150 people and the 4 speaker configuration is for large venues, hotels or outdoor situations. The systems are easy to self-assemble and come complete with stands and all cables. We can also deliver anywhere in Sydney for an additional cost - depending on distance from the Eastern Suburbs. If you prefer wireless microphones instead of the supplied wired units, please add $25 to the total price. We offer generous discounts for multi-day hire. Additional microphones can be added as required. 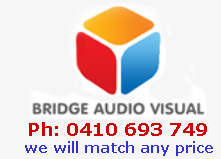 We have experienced sound engineers to operate your system if required. 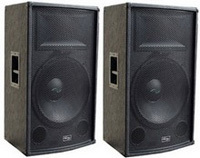 If you are hosting a dance party and need hard thumping bottom end and screaming high frequencies, then these speakers will be just right for you. The package consists of 2 x 18" speakers with horns (tweeters), a 1000W power amplifier, a 4 channel mixer and ipod cables. You will be amazed at the sheer volume of these. Although they are solid and sturdy, they are still light enough for you to carry and will fit into most cars. If you prefer, we can offer delivery anywhere in Sydney for an additional cost, depending on your location. If you need a microphone, we can supply a wired one free of charge. The speakers come complete with speakon cables and the mixer has XLR and RCA inputs for your DJ console. If you need to add some serious bottom end to your Public Address (PA), the best way is to add one of our subwoofer systems. Each unit has an active crossover built in and you can connect them directly to one of the PA systems listed above. You will get a thumping 600W of bass with cut-off frequencies adjustable between 60 - 600Hz. Ideal for dance parties or bands. These subs are surprisingly light and can be carried by one person. They will fit into most cars. You can pick them up from us in Bronte or please call us for a quote on delivery in the Sydney area..